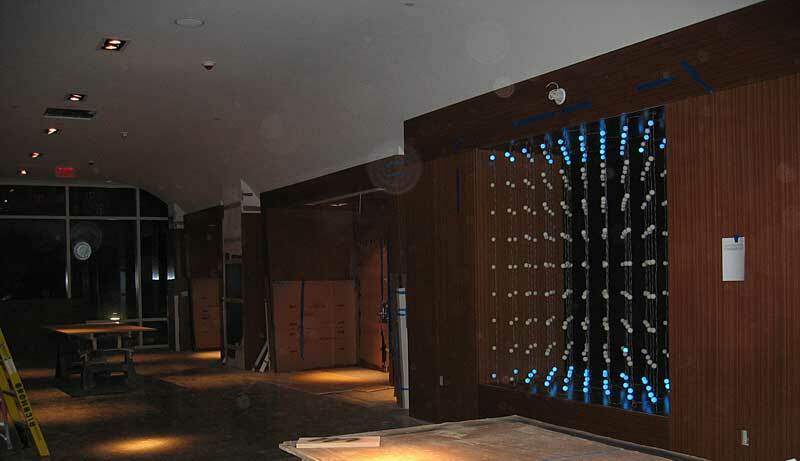 The original Cubatron (well, 5/9th's of it) now has a permanent home at the new W Hotel in Dallas, Texas, second floor. The Cubatron was the world's largest true 3D color graphics display from 2004-2006 (now overtaken by the Big Round Cubatron). It is 8x8x8 feet in size. It consists of 729 voxels (3D pixels) arranged in a 9x9x9 matrix, spaced 10 inches apart from each other. 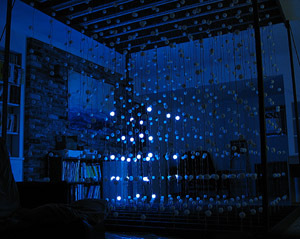 Each voxel is a 40mm diameter ball that can be independently set to display a 21-bit RGB color. The entire display can be updated about 30 times per second. The voxels "float" in space so that the viewer can see through the cube and have a view of most of the voxels from any position. A unix box generates a variety of amazing stuff that is continuously displayed on the Cubatron. There are currently over 35 effects lasting about 35 minutes total. The show repeats continuously. 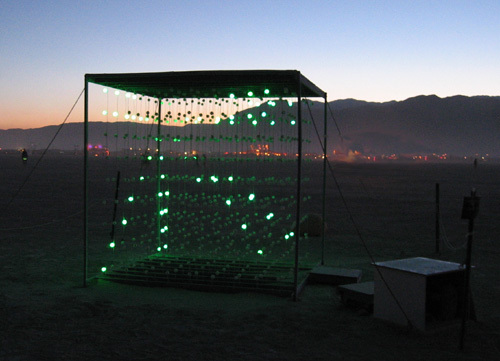 The Cubatron was on display at Burning Man 2004 and 2005. 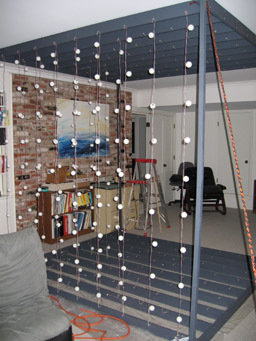 The Cubatron is 8x8x8 feet. It is held up by 4 guy wires, one at each of the top corners of the cube. A "fence" 5 feet from each side of the Cubatron keeps people from touching it, as it is fragile. Thus it requires a footprint of approximately 18x18 feet. The Cubatron only operates at night. A small gas generator is located nearby for power. There are 729 voxels. Each one has a microcontroller on it. There are 27 strings of 27 voxels. The voxels on each string have an address of 1 through 27. They are sent commands using a special synchronous protocol which consists of a frame which contains RGB data for each of the 27 voxels on the string. A frame is sent on every string about 30 times per second. The voxels take the last RGB value they got and PWM the RGB LED to display the proper color. A PC running FreeBSD generates the patterns to display. The PC converts the RGB data into the 27 streams of data to be sent to each string of voxels. It sends this data across an ethernet connection to an ethernet printer server. The printer server's parallel port outputs data to the voxel driver board. The voxel driver board has a PIC18F452 which demuxes the incoming data and sends it out to the 27 voxel strings while maintaining proper timing for the synchronous protocol. The Cubatron requires 100K bytes of data per second. This is a picture of a prototype voxel (before it blew up) without the ping pong ball attached, and one lit up blue with a ping pong ball on it. 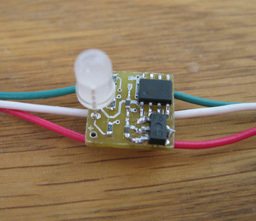 Each voxel has an RGB LED on it that is controlled by a PIC12F629 microcontroller. 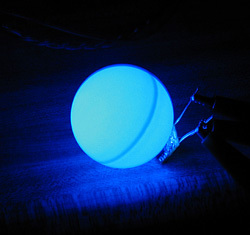 The LED is stuck inside a ping pong ball and glows at any color and brightness level. This is the batch of production voxel boards and the first string. This is the driver box. It contains two power supplies, a fan, and the driver circuit board sitting on top of the ethernet printer server. This is the support structure that holds up all the strings of voxels, and a picture of the final Cubatron running. Unfortunately I haven't figured out how to take a good picture of it yet. Update rate:    30hz (21-bit mode), 50hz (12-bit mode). all voxels update simultaneously. Power:          50W minimum, 500W when all white. The PIC microcontrollers are made by Microchip. Many parts came from Digikey and Mouser. 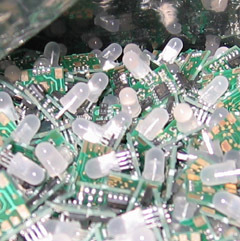 The RGB LEDs come from Nichia of Japan. 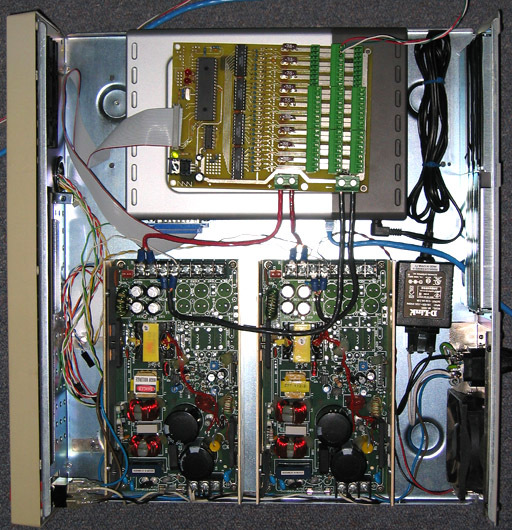 The prototype voxel and driver PCBs were made by BareBonePCB in Aurora, CO. The main power supplies (two 8V 30A) came from Surplus Sales of Omaha, NE. Surplus surface mount capacitors and resistors came from Advanced Component Electronics in San Jose, CA. 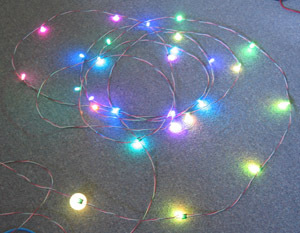 The voxel PCB assembly and string wiring was done by Mentzer Electronics in Burlingame, CA. 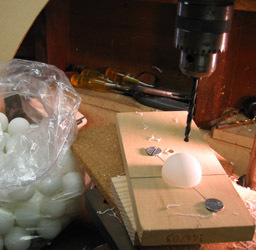 The ping pong balls came from Online Sports. 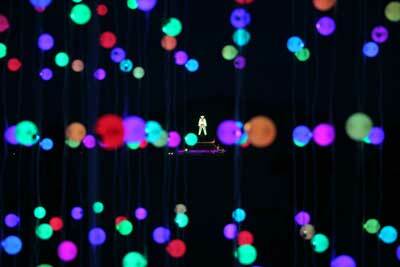 Cubatron is a Trademark of Network Wizards used to describe three-dimensional lighting displays.